"To Mercy, Pity, Peace and Love all pray in their distress/ And to these virtues of delight return their thankfulness." So begins William Blake's Song of Innocence, "The Divine Image." 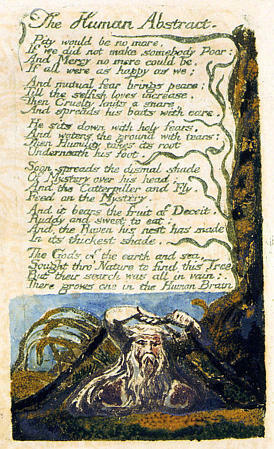 In his Songs of Experience, however, Blake responds point by point to the earlier poem in a manner which is both unexpected and disturbing: "Pity would be no more,/ If we did not make somebody Poor:/ And Mercy no more could be,/ If all were as happy as we;/ And mutual fear brings peace:/ Till the selfish loves increase." The simple, straightforward logic of Blake's surprising response to the conventional sentiments of "The Divine Image" rings devastatingly true, with implications that will be echoed far into the future by the likes of Whitman, Nietzsche, Marx and . . . Brecht -- who "once said that he might be inclined to allow pity and terror place in the theater 'if the theater were to cooperate in removing these conditions among human beings that generate mutual fear and necessitate mutual pity. For the Fate of Man is now Man himself.' " [as quoted in Bertolt Brecht, His Life, His Art and His Times, by Frederic Ewen, The Citadel Press, p. 232. On the same page, Ewen also quotes George Bernard Shaw: "I do not want there to be any more pity in the world because I do not want there to be anything to pity."] For more on the relation between Blake and Brecht, I recommend this very interesting essay, by Brian Cliff: William Blake and Bertolt Brecht: "Without Contraries is no progression"
Blake's poem begins as simplicity itself but quickly progresses into much more difficult terrain. His original intention was to match it with the earlier poem by calling it "The Human Image." But the title he finally settled on is very strange: "The Human Abstract." Is his message equally strange? and abstract? Pity is produced by poverty, mercy by unhappiness, peace is the product of mutual fear, love is compromised by selfishness. From selfishness it is only one small step to Cruelty, which "knits a snare" and "spreads his baits with care." "Holy fears" and "humility" are unmistakeable references to religion, which, nourished with the holy water of selfish tears, "takes root" at the foot of Cruelty itself. And from this root grows "the dismal shade of Mystery" in the form of a tree, bearing "the fruit of Deceit." Pity, mercy, peace, love, cruelty, humility, mystery, deceit. For Blake, the progression from the loftiest sentiments to the depths of hypocrisy is inevitable because all stem from the same root of the same tree. Appropriately enough, the Raven, ancient harbinger not only of war and doom, but symbol also of "ravenous" greed, makes his nest "in its thickest shade." What is this tree, which cannot be found in nature, growing only "in the Human Brain"? If we would want to attribute this conundrum to the mysterious workings of Blake's "visionary" poetry, we'd have to reckon with the poet's own deep suspicion of mystery itself, as expressed in this very poem. I believe there is a simpler explanation. For me, Blake's tree is a symbol of what later would become known as "bourgeois ideology." Existing entirely out of sight, in "the human brain," elusive, mysterious, cruel, deceitful, this repository of ostensibly noble sentiments and ideals, born in fantasies of altruism, love and enduring peace, exists only to spread its tentacle-branches as far and wide as possible, maintaining a rigid system of repression and control. Indeed, the first verse encapsulates the entire notion of ideology, as it would eventually come to be understood by Marx, with remarkable efficiency: "Pity could no be no more/ If we did not make somebody poor." In other words, our noblest ideals can be understood as rooted in a reality of pain and exploitation for which we must assume responsibility. In the spirit of Blake, whose images can be said to in some sense interpret his poems, I have attempted an interpretation of my own, in the form of a musical setting. Since for me the first verse is the key to the work as a whole, I have treated it as a refrain. Recurring three times during the course of the poem, it serves to remind us that all its mysteries have their source in a simple, if disturbing, logic. Since the critical thinking of "The Human Abstract" was conceived as a response to the "innocent" ideology expressed in "The Divine Image," I have included the first verse of the earlier poem as an introduction. In my play, this verse will be sung by a street preacher, accompanied, karaoke style, by some guitar chords played on a boom box. Striking workers will respond, singing "The Human Abstract" to the accompaniment of a lively jam by a pair of street musicians, playing a real guitar -- and bass. To listen, click here. Scroll down to follow the music and text.